TL Putnam came from a long line of Methodist preachers, all the way back to the era of the circuit riders! As such, he always had the internal sense that he’d somehow be involved in ministry himself. After getting his formation at Asbury Seminary and working in Methodist churches as a worship leader, he began to investigate the Catholic Church more fully, especially through the mentorship of a relative who was a Catholic priest, who helped him understand the purpose of liturgy. That, combined with an appreciation of Catholic teaching on marriage and family and a number of other realizations led TL to discern a clear call into the Catholic Church. There are some great insights from TL’s experience for anyone who comes from a non-Catholic ministry background who wants to enter the Church but is afraid of what it might mean for their careers. If you’re a non-Catholic clergy member who is struggling in that area, the Coming Home Network can help. 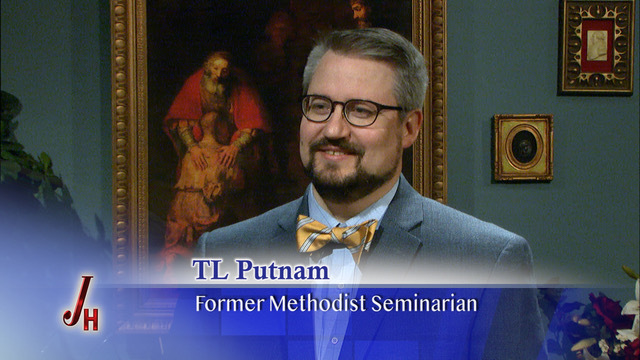 A former Methodist worship leader, TL Putnam has served the Church in a number of capacities related to catechesis and family life since becoming Catholic. TL is the host of Outside the Walls, a radio show that explores the foundations and implications of faith.